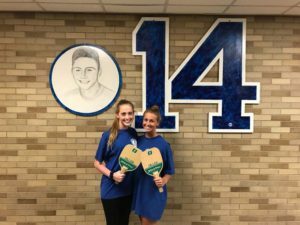 Elwood-John H. Glenn High School students recently participated in the Sean Urda Memorial Scholarship Pickleball Fundraiser with all proceeds going towards the Sean Urda Memorial Soccer Scholarship Fund. The doubles tournament allowed students to pay a fee of $20 and play against their fellow classmates for a good cause. Juniors Tori Cacioppa and Katie Brown and seniors Joe Muchniki and Greg Thorhill were named pickleball champions at the conclusion of the tournament.